The Divide Overweight Shipments feature prevents you from attempting to ship overweight orders by automatically splitting the order into multiple packages. A customer adds several items to their cart that weigh a total of 200 pounds. Next, the customer selects UPS Ground which has a weight limit of 150 pounds. 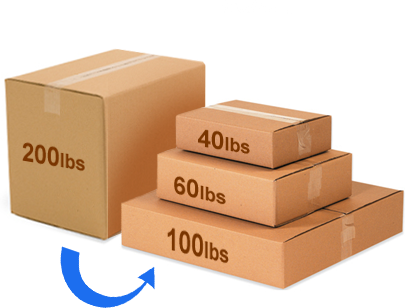 The Divide Overweight Shipment feature will fill the first package up as much as possible without exceeding the 150 pound limit. Then, it adds the remaining items into a second package. Finally, the shipping cost for the two packages are added together and the total is shown in the checkout.